Piezo Buffer Pre-amp with EQ. 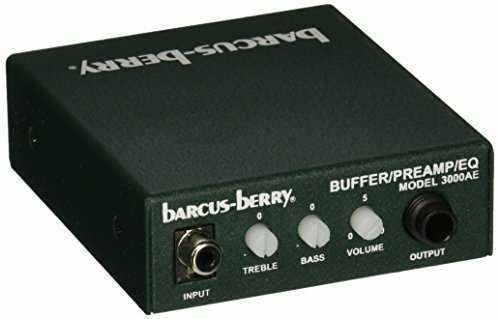 Specifically designed to work with all Barcus Berry electret mic systems. Features external bass, treble and volume frequency controls to allow a wide range of adjustments. Includes a belt clip for unrestricted movement. Input (EQ Flat): Input Interface = RCA unbalanced. Input Impedance = 2.2 Meg Ohms. Maximum Input level = 2.0 vrms. Output (EQ Flat, Volume Max) Interface = 1/4-Inch unbalanced. Impedance = 2K Ohms. THD = .008% @ 1kHz. Noise = -92 dBu. S/N = 100 dB. Bass = +/- 12 dB @ 50Hz.